Pewter does not get along with dishwasher detergent, so you should never wash your pewter tankard in the dishwasher. But don’t despair, a quick hand-wash with your usual mild dish soap is almost always sufficient to bring your tankard back to an attractive shine. Honestly, that’s all the cleaning and care you are likely to need for your tankard. However, if you do want to maintain it in a pristine condition, perhaps for display purposes, or want to revive a ‘tired’ tankard, how you polish your pewter will depend on whether it’s a shiny or satin/ antique finish. Tankards with a shiny finish can be polished with a paste made of flour (1/2 cup), vinegar (1 cup) and salt (1 teaspoon). Mix these ingredients in a bowl into a heavy paste, smother it all over the pewter, and let it dry. Then you can wash the mixture off and rinse the tankard with warm soapy water, before drying carefully with a soft cloth. Satin or antique-finished pewter tankards really don’t need special care beyond hand-wash after use, but if you really want to you can use some (very) fine steel wool. It’s best not to use your pewter tankard to drink very corrosively acidic drinks like soda or (some) fruit juices. If you do, make sure you at least clean it quickly afterwards. These drinks can stain your pewter. Soda can have a pH as low as 2.5, while a beer is more likely to be around pH 3.5 to 4.5, with wheat beers being towards the lower end of this range. So, because of how pH is defined, that means soda can be at least ten times more acidic than beer. What about commercial pewter polish? Honestly, we can’t recommend any because we’ve never had a need to use one. The methods described above have always been good enough for our purposes. But we've heard good things about Hagerty's pewter wash... if you try it, let us know! 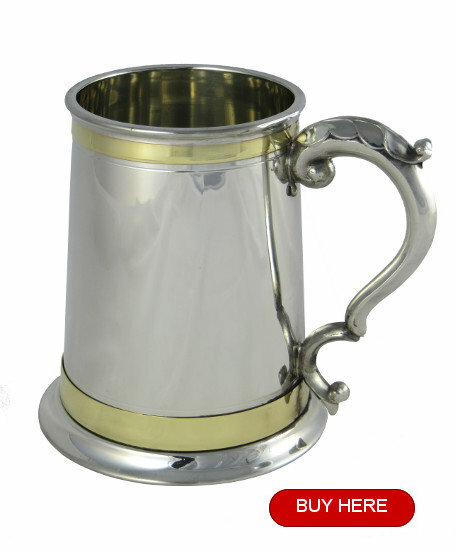 See our selection of amazing pewter tankards, all with free shipping throughout the USA.